A local newspaper start-up which launched its first print edition last May has taken on its first full-time member of staff. 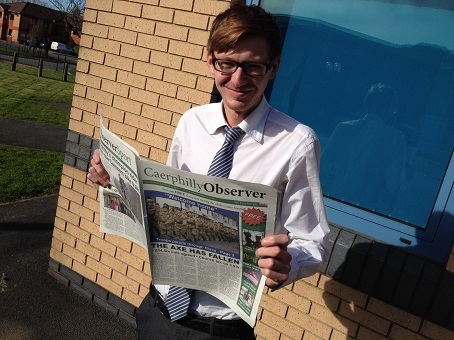 Journalism graduate Gareth Hill, 24, has joined Caerphilly Observer through the Welsh Government’s Jobs Growth Wales scheme. The Caerphilly Observer began life as a website in 2009 and launched its fortnightly print edition in May last year, after securing an EU grant through Caerphilly County Borough Council. Established by former Brighton Argus journalist Richard Gurner, the free newspaper has a distribution of 10,000 copies a fortnight. Bournemouth University graduate Gareth, who is originally from Bridgend, said: “It’s great experience for a young journalist to be joining a vibrant local newspaper which prides itself in representing the local community. Added Richard: “Caerphilly Observer is continuing to go from strength-to-strength. Late last year we moved into our own offices with a view to taking a new staff member on. “The addition of Gareth will now enable me to concentrate more on the commercial side of the business and grow Caerphilly Observer into the news service I believe our community deserves. “The launch of our print edition has seen a significant increase in the number of local businesses advertising with us and the response we’ve had has been nothing short of overwhelming. As well as Richard and Gareth, the paper also employs a part-time talented advertising executive, Jan Withers. Caerphilly Observer’s website now attracts an average of 69,000 page views and 25,000 unique visitors a month.